Yep, it’s another random line-up of fun for Sunday – oh yeah, it IS Sunday, that’s right! I still crack myself up on how I tend to forget what day it is. When you’ve been out of the Monday to Friday working groove for awhile the calendar in the mind gets a little mushy! So first thing up was taking care of business this morning – I decided to put on a pot of coffee and just enjoy it at a leisurely pace. Just a dash of skim milk in the mug is all I need – no sugar, half & half or anything like that. I don’t understand the reasoning of killing your coffee in order to enjoy it! But I guess it’s a caffeine fix nonetheless. I’ve been trying to alternate morning coffee with Lipton cold-brew iced tea so I don’t get too dependent on coffee. And the iced tea is just wonderful. I just fill up a giant glass Pyrex measuring cup with water, throw in a bag of tea, pop it in the fridge and it’s good to go in 5-10 minutes. Yum! I could have sworn I had a large pitcher somewhere around in my kitchen cupboards but they are deep and it’s easy to lose things in the back corners. Sigh…just another thing for the “updating” list of home projects – these cupboards need some lazy susan rotating shelves in the corners for sure. I sat down one afternoon about a year ago and cleaned out all of the pots and pans and was shocked how many I have. It felt good to downsize and I gave the ones I didn’t need to a charity which supports transitional housing. But yet, I still lose stuff in those cupboards…I swear things must burrow tunnels and hide or clone themselves! Now that I think of it, one silly way I remember when it’s Sunday is that I file my weekly unemployment benefits claim. It’s nice that the funds are there, and even nicer that claims are filed online and the money gets direct deposited. So much more convenient than the last time I had to do this in the early 1990s…we were still old school, mailing in claim forms in the snail mail and getting hard copy checks to go deposit. How far have we come in 15 years?? Dang I hope I never have to go through this again. But even this weekly ritual is wimpering out this week, for after this batch my allocated amount drops to zero. Could the timing be more aligned or what? I am going back to work later this week! YES! I can’t wait – and frankly neither can my wallet! Oh, and what happened with the garage door dealio from last week? I’m sure you were all in suspense wondering. [That’s a joke, people.] I am now the proud owner of a brand new spanking – and supremely quiet and smooth running – garage door opener! I never thought of my old one as loud or annoying – well, up until the part when it crapped out – but WOW, this one is amazing. The guy who replaced it was super nice and pointed out a lot of other things to do to keep the garage door running smoothly. Love me some Man Help! While he was working I apologized about the mess of leaves and crud everywhere and he smiled and said don’t worry, this garage is CLEAN compared to some he’s worked in. That’s a bit scary actually. Yeah, I’ve lived in this place a little over seven years and I still feel like a total amateur when it comes to home projects. Before buying this place I never gave two shits about window treatments. But soon after I moved in it came time to replace the outdated mustard yellow blinds in the front window and pick out something new. And pay for them! Same with the old brown doors – and new doorknobs! I’m super excited for randomness this afternoon! I’m meeting a friend to help her with furniture shopping, we’re going to grab sushi for dinner and then watch some hockey! The NHL playoffs are in full swing and I am a bigtime Vancouver Canucks fan. Tonight they’ll either beat LA and win their first round in the playoffs or it’ll go to game seven. Who knows! These teams are very evenly matched. Sushi flat out rocks. I could seriously eat it every day and be happy. And, for awhile, I was doing just that! 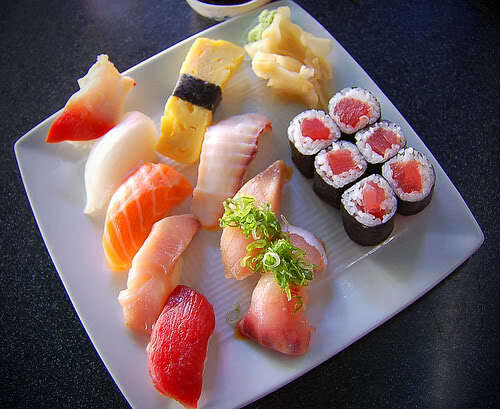 A nearby grocery store has a sushi section where they make it right there in the store and I would usually grab a nice spicy tuna roll with extra wasabi – sheer bliss! Even that picture above makes my mouth water. And why am I a Canucks fan? Well, when I took up hockey a few years ago I also started watching it a lot on TV. And just decided I would start cheering for the NHL team that’s geographically closest to where I live. Honestly, that’s it – and I got hooked! I am so incredibly thankful, grateful and honored to have such great support through the ups and downs all these months. I’ve probably blabbed about that in here ad infinitum but it’s worth repeating! I met up a few days ago with M, a colleague I’ve been working with on the pro bono work these past months. He and I have worked together and known eachother a good 10 years or thereabouts. He’s been a longtime mentor/big brother type to me and always has great ideas and advice. It felt good to catch up over burgers and beers in a dive bar I hadn’t been in since before the smoking ban went into effect around here a few years ago. [The last time I’d been in that place the smoke was hanging 3 feet off the ceilings]. But dang they’ve got great food! And I even had someone email me about setting up a “mailbag” thing in here, to send in blog post requests or other stuff. Wow! That would make it a lot more interactive in here. And no, I didn’t pay this person to write to me either, heh. If I can set it up in a way that’s easy to manage and monitor then I will give it a whirl. But stay tuned…there’s a lot of stuff coming up later this week!